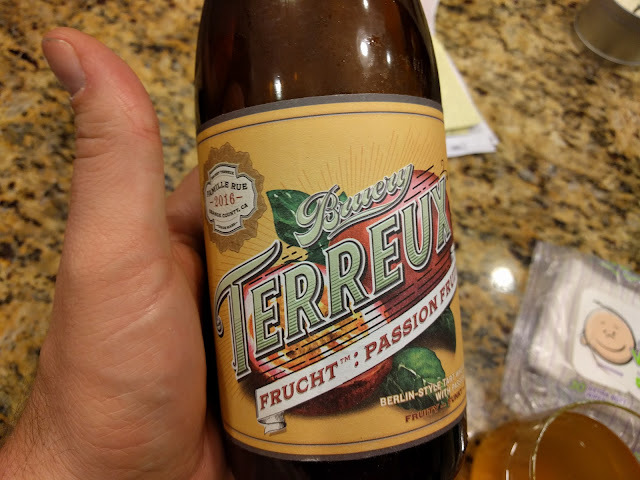 Dr. Jeff brought over this Terreux Fruct Passion Fruit Berliner Weissbier from The Bruery for one of his beer tastings recently. There aren't enough ratings over on Beer Advocate, so it isn't rated, but based on the other things he brought, I'm guessing it will rank pretty highly. I tend to like these fruity-wheat beers (that's what this is, right??? I'm *so* not a beer sommelier! ), and this one was interesting. Can't drink tons of it, but enjoyed my half-a-glass.